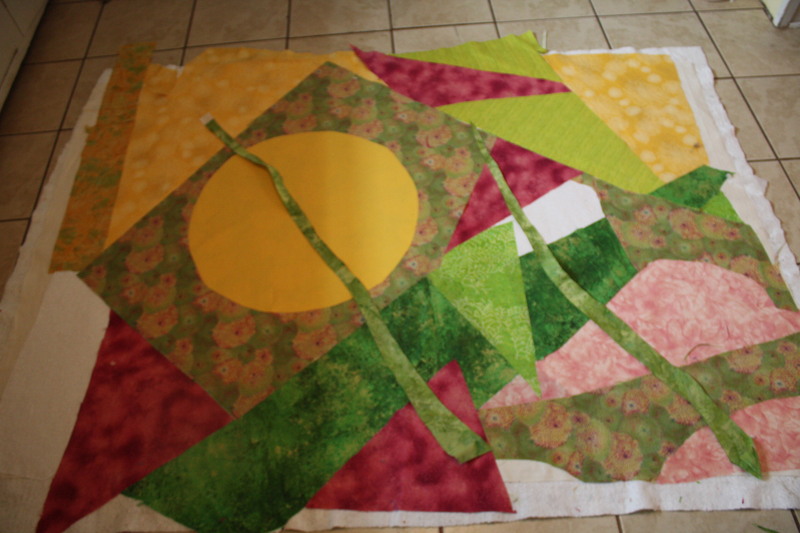 Where we left off on this tutorial & the making of two art quilts was all the bits and pieces had been cut out and fused to the background fabric. But now we need to finish the edges to prevent fraying and make it more finished looking. You notice that the pieces have been layered yet the top layer with daisies is as yet unattached. You have 2 basic choices to finish the raw edges. 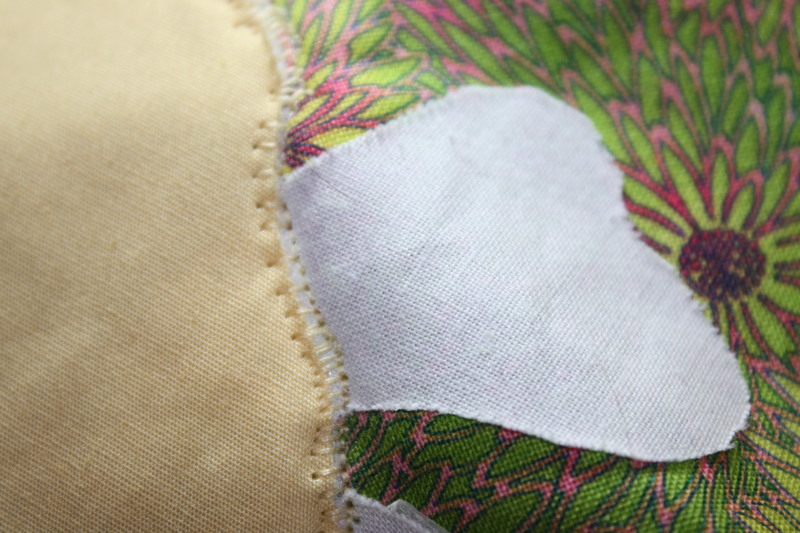 You can sew a single line outlining each piece. 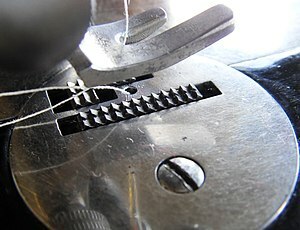 Often this is done in a clear poly or nylon thread. There are a few brands, all good. Or outline with the color of each piece, a lot of thread changes here. On either of these two choices you are using a straight free motion stitch. 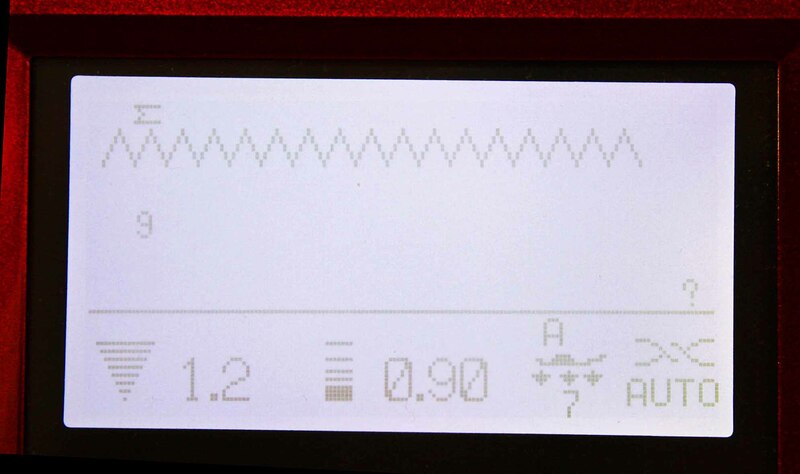 Free motion stitching is not as hard as the reputation it has received. A little practice to get the hang of it until you feel confidence is all that you need. As Diane Gaudynski, one of a small talented group of machine quilters, who quite literally are the best of the best in the field, “Keep quilting – your work gets better every day!”..If anyone’s knows, its Diane. Diane’s link is listed & I have an interview with her in the archives. step 2- adjustments to upper tension, check your manual for the recommended setting and make adjustments as you continue, because there are many factors that influence the number. Play with your machine and find what works. Step 3-You’re off….whoo whooo….Once you’ve gained a little confidence your goal is the sewing machine speed on the fast side, while you are ignoring that racing engine sound, are attempting to move the fabric slowly and steadily. Do not keep pace with the machine’s speed. Slow and steady as she goers. I left out tons of info, like pulling the bottom thread to the top, quilting machine gloves. threads, , on and on.Go get one of Diane’s books, I recommend, ” Guide to machine quilting”, it was the best one I read when I was learning. 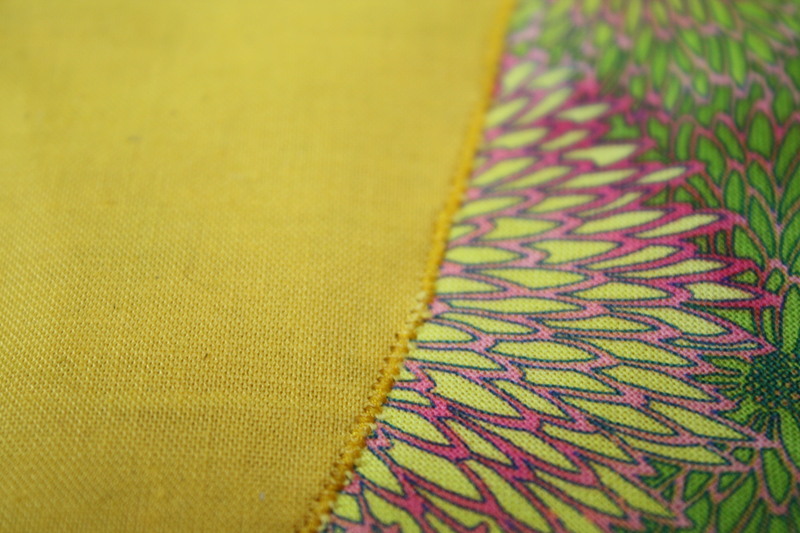 Pressing on The second method of finishing the edges is to use a zig zag stitch on free motion with a narrow width, I often go with a setting of 1. Starting off go a little wider to help stay on the edge of the fabric applique and connect with the fabric underneath. Go slow if you need to. 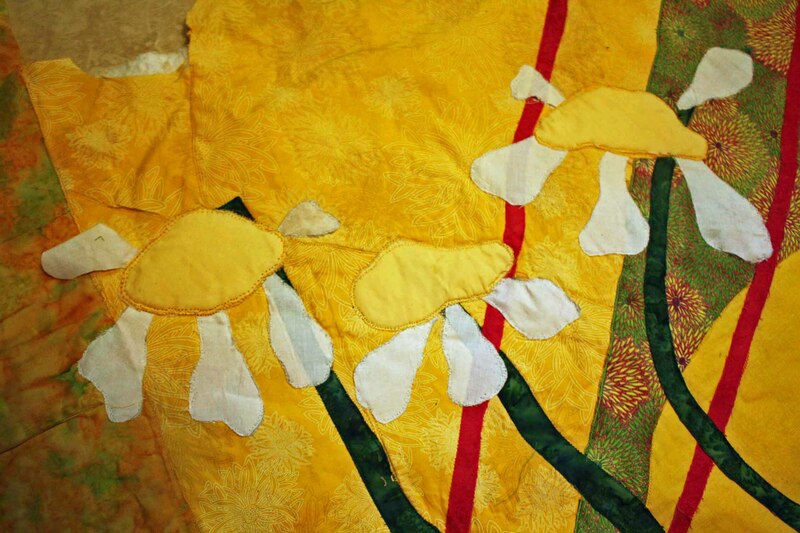 If your applique pieces are fairly straight and no sharp curves or turns , you could zig zag the usual way with your dogs up.It looks nice, but if you can’t follow along the edges, not so much. Do you see a obvious proble here? The stitches are spaced too far apart. It doesn't even cover the batting I used here for puffiness. Change your setting to make them closer together. Next layer started, placement and finishing the daisies. Looks like everything's fused down and raw edges finished. Next post; thread painting on Sunflowers. P.S. : Scuse! I found your ETSY tab at the top of this website. Will pursue from there, okay? I was just writing you and erased the message accidently. i was suggesting that thought, commissioned work costs more, those two were over $400.00 each. I have a variety of originals that are aready made up. If that is any help. Please, please email me on how I can get one of these for my mother-in-law for Mother’s Day, 2012? It CANNOT be much larger than a single-bed size! She has a phobia about guilts and comforters and blankets (anything but sheets) hanging over the bedsides more than about 4 inches each side. But I KNOW she would love this, or a similar design. PLEASE EMAIL ME, okay?